Thought Carnaval was just four days long? Think again! 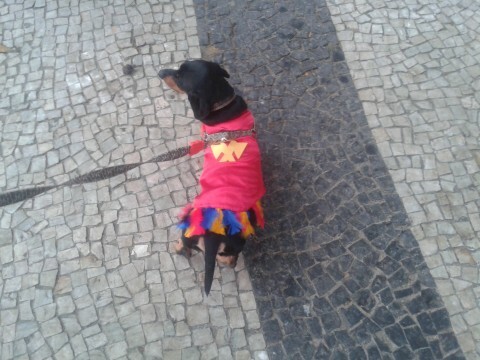 The Editor experiences a host of pre-carnival parties and parades in Rio… without unduly damaging his bank account. It’s just gone 1pm in the Largo de São Francisco de Paula square in Rio de Janeiro. To my left a 6’2″, heavily bearded man is happily posing for pictures dressed in a twee, baby-girl pink skirt; to my right a fat guy in a wife-beater vest and bermuda trunks is standing on top of a truck casually hosing down the crowd with a water cannon (…which is thankfully just out of range); in front of me a drunk Brazilian guy in his late twenties is locked in an almost pornographic French kiss with a woman at least twice his age. He has just snogged her two, similarly venerable friends, who are now looking on and laughing. The soundtrack to this scene of midday pandemonium is a mix of brega and funk blasted out by a band to the eager, jumping party-goers, some of whom started drinking at 7am. Nope, this is not the Rio Carnaval, it’s the Fogo e Paixao “Bloco”, one of literally hundreds of pre-Carnival parties that take place in the lead up to the big event. One you’ve touched down in Rio during Carnival season few words will be more ubiquitous, and possibly ambiguous, than “bloco”. At the risk of embarrassing myself as a newbie, as far as I can tell the definition of a bloco is an organised street party, with music, that can take place any time before, during or after Carnaval. They get their name from the fact that the band (usually) march around the block, leading a Bacchanalian parade of revellers with them. Typically blocos have a) a name b) a set date, place and start time c) a defining style of music and d) a theme (optional). They repeat every year with the same name, style of music and themes, meaning each bloco is likely to have its fans and adherents, especially if it’s been going for a number of years. What’s more new ones are formed each year and approved by the city. Did I mention they are completely free to attend? Much more than the Samba school parades in the Sambadromo, these blocos define the Carnaval experience in Rio (and other cities) and if you haven’t been to at least ten by the time you’ve left Brazil then you’ve been doing something badly wrong. Typically, during an intense day of partying you might hit two or three in one day, and as they start two or three weeks before the official carnival dates, and continue for at least a week after, you’ll be hard pressed to remember all the ones you went to! 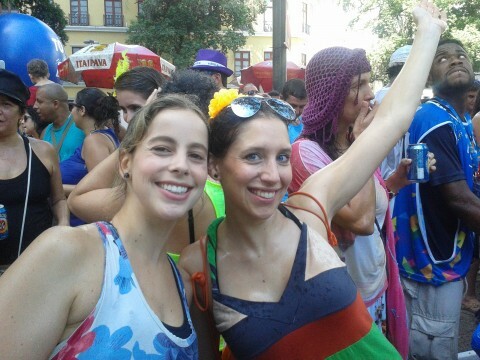 Reaching back into my subconscious I can recall my first ever bloco was a smallish but fantastically fun affair in Leme, at the end of Copacabana beach, celebrated with many new friends from my language school, and marked by possibly too many cheap caipirinhas. I also recall being chatted up by two 18 year old girls in the men’s toilets, but after that it’s all a blur. You will have to Google/Bing around a bit, plus brush up on your Portuguese, to find a reliable agenda for blocos… WikiRio could be a good start. Beyond the official and expensively-ticketed parades at the Sambadrome, are the free rehearsals at the very same venue. 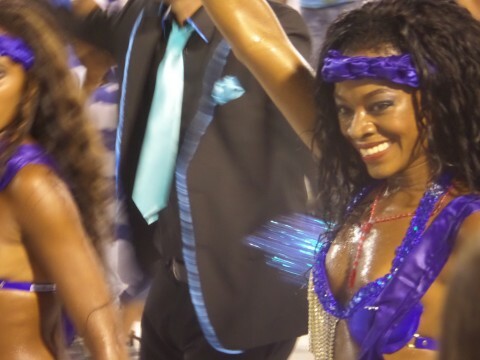 Yep, in the build up to Carnaval you can go and check out the samba schools full dress rehearsals for free, instead of shelling out hundreds of quid for tickets. No doubt they lack some of the magic, pomp and ceremony of the real thing, but we spent a very enjoyable evening reclining in the best seats in the house and watching as Portela samba school (one of the oldest troops, established in 1923, and all time leading winners with 21 crowns!) marched by in their signature blue and white colours… a blur of divas, dancers, musicians, singers and hipshakers and footstompers of all ages. 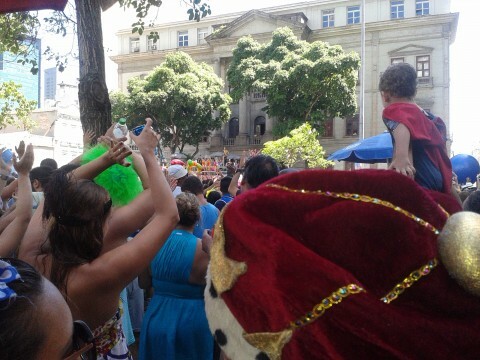 You might have to ask around to find out exact times, but typically every night in the lead up to official carnival, different samba schools will parade down the mighty Sambadromo, to the joy of Rio’s poorer citizens who turn up en masse to enjoy the spectacle at their favourite price… gratis! So there you go… I didn’t celebrate carnaval in Rio, but what with all the blocos I went to, and visiting the legendary Sambadrome, I almost felt like I did. What’s more, I didn’t pay a penny (aside from cheap drinks from local vendors), nor did I have to shell out on inflated Carnival-priced accommodation, since I left town either side of the four official days of the festival. Worth bearing in mind if you want a full on flavour of Brazil’s biggest festa, but without the expense. Right, next up I’ll highlight a few more cool things to do in Rio, before taking you on a ride north to Recife and Olinda, where I had heard the best Carnaval in the country awaited…. but were the rumours true??? To keep up to date with Urban Travel Blog “On The Road” check out our Facebook page (where we publish extra photos) or our Twitter account. Tchau for now! wow SO FUN – definitely on the bucket list, thanks for all the details.